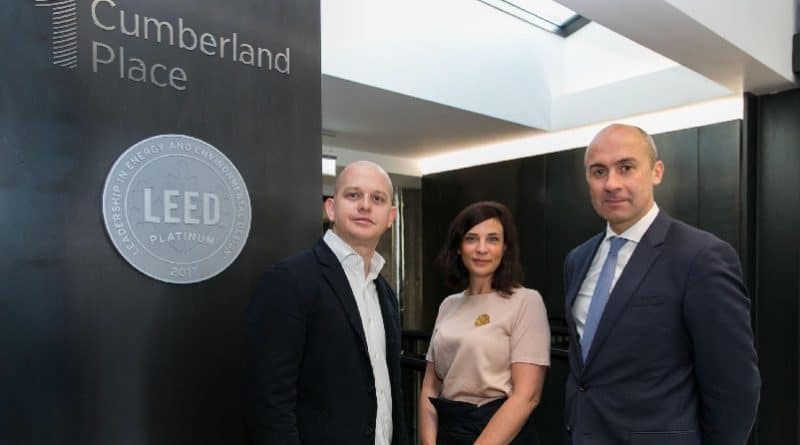 A delegation from the Irish Green Building Council toured Hibernia REIT’s 1 Cumberland Place to officially unveil the building’s LEED Platinum level certification for a Repurposed Building. The ceremony coincided with World Green Building Week. Located close to Trinity College, 1 Cumberland Place was completely refurbished by Hibernia Reit in 2016 and is one of the few office buildings in Ireland to achieve this certification. LEED (Leadership in Energy and Environmental Design) is a globally recognised certification standard for sustainability in buildings, and LEED Platinum is the highest award level available. Sustainable Site – The project involved the refurbishment of an existing building, thus reducing material consumption. The city centre location is served by an extensive public transport network and facilities have been provided to promote cycling to work, reducing reliance on cars. Vegetation – Generous open space has been provided with native and adaptive planting prioritised, reducing the need for additional watering, increasing site biodiversity, and providing visual interest for occupants. Water Efficiency – Water efficient sanitary fixtures which specify the correct low flow have reduced overall building water consumption by 32% over the LEED baseline. Energy Efficiency – Energy efficient plant and LED lighting installations contributed to a 37.5% reduction in building energy costs over the LEED target/baseline. In addition, the building’s heating and cooling system has a thermal efficiency of over 68%. Waste Recycling – The building provides waste collection facilities that enable tenants to streamline waste recycling. Healthy Indoor Environment – Low VOC paints, coatings, adhesives and sealants along with LEED compliant flooring systems were specified to reduce air pollutants which may cause irritation to occupants. Building Materials – Sustainable, locally produced products and systems, containing high levels of recycled content were prioritised. In addition, waste minimisation efforts ensured that 99% of construction and demolition waste was diverted from landfill.